Kiev: He's a TV comedian. Now, he's into some serious business. 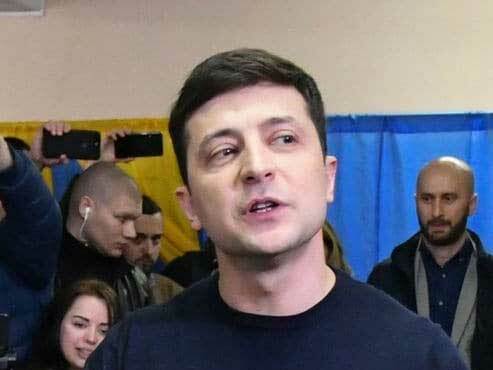 Volodymyr Zelensky, 41 (born 25 January 1978) put on a good show on Monday in Ukraine's first round of presidential election, with over 70 per cent the votes counted. The election commission website gave Zelensky 30.2 per cent with President Petro Poroshenko trailing on 16.7 percent. If the trend continues, there will be expected second round run-off vote on April 21, which Zelensky is likely to win. That means Zelensky, who has no previous experience as a politician, would lead 45 million people in one of the Europe's poorest countries fighting Russian-backed separatists in its industrial east. If the trend continues, there will be expected second round run-off vote on April 21, which Zelensky is likely to win. That means Zelensky, who has no previous experience as a politician, would lead 45 million people in one of the Europe's poorest countries fighting Russian-backed separatists in its industrial east. Before he dabbled in politics, Zelensky was a screenwriter, actor and director for Ukrainian film studio Kvartal 95. The father of two is the standard bearer of the ‎Servant of the People party. Voters are pinning their hopes on Zelensky, who is educated in Kyiv National Economic University‎. His platform may be vague, but supporters insist only a total outsider can clean up Ukraine's murky politics. Zelensky has yet to spell out in detail what he would do in power and one of his campaign slogans was: "No promises. No apologies." Partial results show the comedian got almost twice the vote share of his nearest rival, the incumbent Poroshenko. 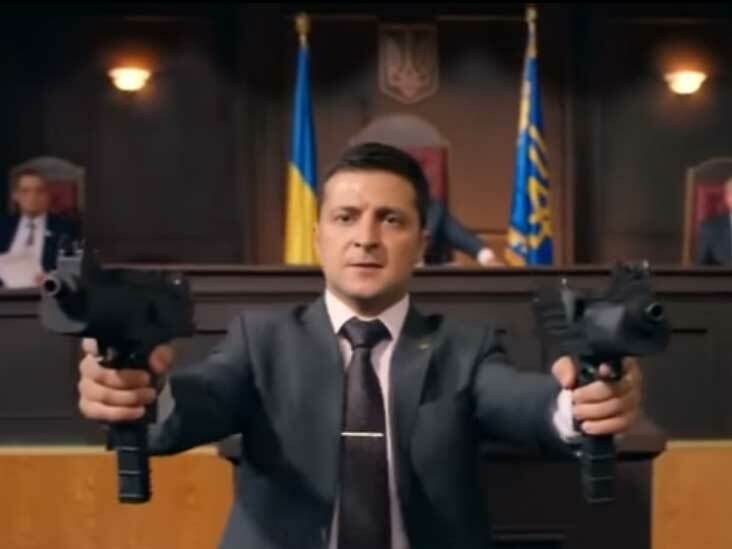 Zelensky's political experience had been limited to playing the president in a TV show when he announced his long-shot candidacy at the start of the year. His route to the pinnacle of political power in his country is uncannily similar to the rise of Trump, who had no political experience but had a strong TV presence. Trump, a real estate tycoon, starred in US TV show The Apprentice, hosting the first 14 seasons before he became the Republic Party's standard bearer and took over the White House. Zelensky, for his part, spewed out anti-establishment rhethoric, capitalising on frustration over corruption and a stalling economy to leapfrog his opponents. Ex-prime minister Yulia Tymoshenko, who was herself favourite when she launched her campaign, was knocked out with 13.08 percent of the vote, the figures showed. Zelensky had topped opinion polls for weeks and the main question going into the Sunday vote was who of Tymoshenko and Poroshenko would meet him in the second round. But the size of his victory came as a surprise to many in Ukraine. Population of Ukraine, one of the poorest countries in Europe fighting Russian-backed separatists in its industrial east. Political analyst Anatoliy Oktysyuk of Kiev's Democracy House centre said it would be "difficult" for Poroshenko to knock the actor off course. "He (Poroshenko) has no room for growth. He has played all his cards," Oktysyuk said. The actor eschewed rallies and interviews in favour of playing gigs with his comedy troupe up to the final days of campaigning. His political comedy "Servant of the People" returned for its third series this week. Zelensky’s strong showing reflected widespread disappointment over what many see as a lack of tangible change in the country after a pro-Western revolution five years ago. All three said they want to continue building closer ties to Western institutions such as the European Union. But the election put a spotlight on popular disdain for the political elite and the potential for continuing instability in one of Europe’s most geopolitically pivotal countries. Thirty-nine candidates were listed on the ballot. Tut the race narrowed to three main contenders: Poroshenko, who is seeking a second five-year term; Tymoshenko, a former prime minister and political prisoner; and Zelensky, the political novice. All three portray themselves as pro-Western: said they want to continue building closer ties to Western institutions such as the European Union. But the election put a spotlight on popular disdain for the political elite and the potential for continuing instability in one of Europe’s most geopolitically pivotal countries. If he wins the runoff, the untested Zelensky will face challenges ranging from navigating economic doldrums to negotiating with Russian President Vladi­mir Putin. Oktysyuk suggested Poroshenko would try to frame the contest as part of a wider confrontation between Moscow and the West — presenting himself as the only candidate who could stand up to the Kremlin. The president said the results were a "harsh lesson" for him personally and for the country's authorities as a whole after exit polls were released late Sunday.